The first time I heard of a library running a book club in a bar was several years ago, when Oak Park (Ill.) Public Library’s group, Genre X (genre-x.com), was starting to pique the interest of librarians. At that point, I was working in academia but was also running literacy-based fundraising events for a group called Chicago Deskset in bars around Chicago, and I consistently found those interactions with people fascinating. If we were doing a book drive, people would run home, grab books, and return to the bar to donate them. 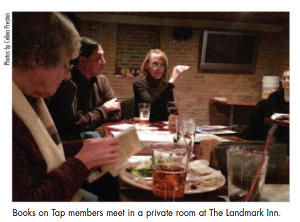 Later, when Northbrook (Ill.) Public Library hired me in 2011, I really wanted to start a book club in a bar. 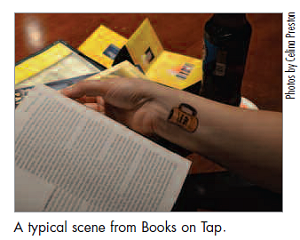 And so Books on Tap was born in summer 2012 with a lot of hard work and 25 copies of Swamplandia. The group now meets monthly, alternating its discussions between predetermined titles and “Books & Brew” sessions, where people can discuss whatever they’re reading at the moment. Now, 1 year later, we have a core group of 16 people and up to 25 people on any given night. Both men and women and people of all ages belong to Books on Tap, and the group is one of the most professionally fulfilling things I have ever been involved with. It also helps people think of libraries in a whole new way. I learned that wording was incredibly important. While preparing my pitch, I changed “book club in a bar” to “book club in a restaurant” and found that reticent people were more apt to get on board after this simple word shift. But since the idea of a library-run program with booze was freaking some people out, I decided to write a formal proposal to explain it all. Writing out my reasoning not only helped me formulate my argument to tackle the tough questions but also gave my managers something concrete to take to the library board for approval. The proposal took time, thought, and research, and it helped prepare me for the planning to come. My proposal started simply, with a list of ideas and points in order to organize my own thoughts. I needed to know the Five W’s: who, what, where, when, and why. The proposal had several main sections, which coincidentally, make an excellent how-to guide for those who want to start their own book club in a pub. In this article, I’ll share some basics from each section: purpose, target demographics, location, branding/advertising/budgeting, and book selection. Purpose: My reason for starting a library book discussion group in a bar was to attract and engage those in the community who probably weren’t attending library programming and possibly didn’t have library cards yet. At Northbrook Public Library, we had great programs available for the very young and the very old but not a lot for the ages in between. I wanted to concentrate on people who were not being served yet. Also, I wanted to update the library’s image within the community and felt this was another way to show people that it’s not just a storage facility. Target Demographics: Back when Oak Park PL’s staff first started Genre X, they specifically labeled it as a “20s and 30s Book Discussion,” but I wasn’t sure whether that would be a good fit for Northbrook. My service community has a younger population, but often they are college students who might not have the time or disposable income to join the group. My target market is working adults between the ages of 25 and 50, and I felt that I could attract them in all sorts of ways without directly putting the age range on my promotional materials. Branding, Advertising, and Budgeting: I knew that the important part would be to keep the program cheap because there was no budget for it. I hoped that word of mouth and good old-fashioned signage would get us off the ground. In my proposal, I stated that I’d use free or inexpensive promotional tools, such as social media pages and in-house design. I also assured the decision makers that I’d use consistent branding that would credit the library for this program even though it would take place off-site. Book Selection: I listed 11 books I had in mind and explained my reasoning for wanting to choose slightly different titles than I would for our average book discussions. I made the final decisions when the proposal became a reality. After writing my proposal, I presented it to my supervisor and the assistant director of the library. Then our assistant director presented it to our library board and received permission to move forward with the program. The time frame between the beginning of my research and the first meeting of Books on Tap was around 6 months. The first thing I needed was a venue, so after I got the green light, I returned to the best spots a second time, on the day of the week that we planned to hold our meetings. This way I could tell if it was a good night for the bar as well as for me. While scouting locations, I tried to pay special attention to the actual space and layout. I was hoping to find a place with a private room in order to limit noise issues, or at the very least, a place with a large table that could accommodate 10–20 people on a weeknight. This turned out to be a challenge but helped eliminate several locations right off the bat. I believe strongly in supporting local businesses, so I didn’t look at any national chains. A location needs to have some personality, a role in the community, and something unique that makes people want to hang out there. I lean toward pub-like bars because they tend to be cozy and locally owned. Most serve food as well as drinks, and people like to congregate there already. Finally, I wanted good servers and communicative management, so when I was interested in a location, I asked to speak with the manager. I wanted to make sure they were interested in working with the library and also that they would guarantee that we could get separate checks (which was a make-or-break issue). After exploring various locations, I ended up going with The Landmark Inn in Northbrook, Ill. (landmarkinnbar.com). It is an institution in the community, partway between a dive and a pub. It’s the type of place where people watch Blackhawks hockey games, eat burgers, and drink locally brewed beer. Even better, it’s located almost directly across from our Metra commuter train station in downtown Northbrook, which makes it a convenient place for people who may be commuting from their jobs in downtown Chicago. The management loved the idea of the library holding a book club at the bar. At first, they asked me if we wanted to meet there every week! The other main startup issue I had to settle was choosing a name to help set a lighthearted tone for the group. In my proposal, I had suggested several different names and logo options, including Books & Brews, Pints & Pages, and PubFiction. After crowdsourcing ideas on Facebook and Twitter (a tactic I use whenever I need to come up with a name for something), I decided on Books on Tap. After that, I met with the graphic designer at my library, Celina Preston, to start working on a logo. We played around with several ideas and opted for a simple beer mug. 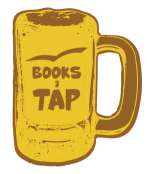 This logo goes on absolutely everything related to Books on Tap, to ensure consistent branding. We created posters, which I put up all around town—in grocery stores, coffee shops, local craft stores, the train station, and even a liquor store. 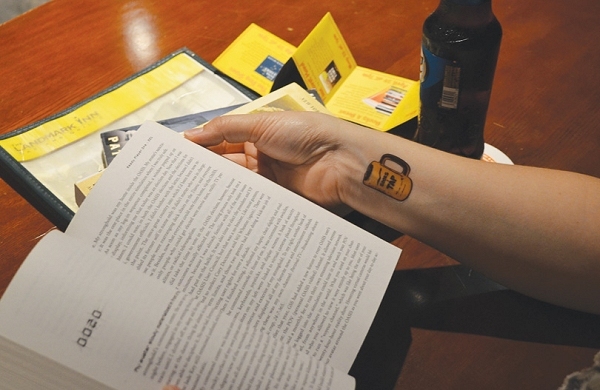 More recently, we created temporary tattoos of our beer-mug logo. 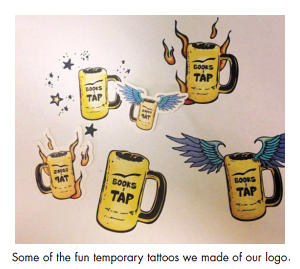 We used our own inkjet printer and special tattoo paper (available at craft stores) and cut them with our in-house custom die-cut machine. 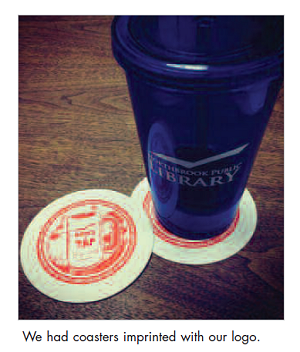 Both of these fun promotional materials have gone over incredibly well with the members of the book group. 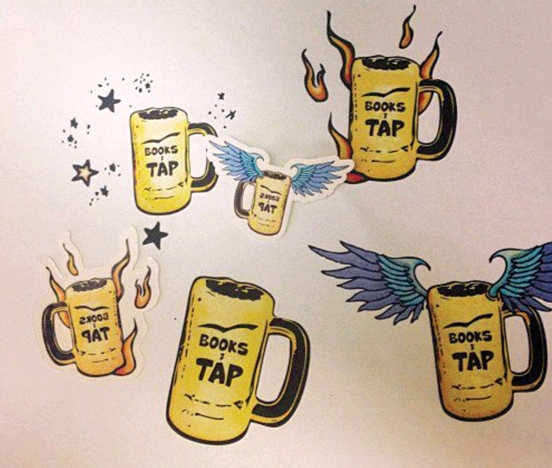 For both marketing and communication purposes, I created a Facebook page specifically for Books on Tap, and I promote it heavily on all of the library’s social networks. I also routinely put up posters, fliers, and schedules in our commuter train station. Before the first meeting, I reached out to a local newspaper and it did publish an article, but we didn’t see a lot of attendance based on the press coverage. The wonderful thing about this program is that I get to select books that I could never use for an in-the-library discussion, such as Cloud Atlas by David Mitchell or Mr. Peanut by Adam Ross. 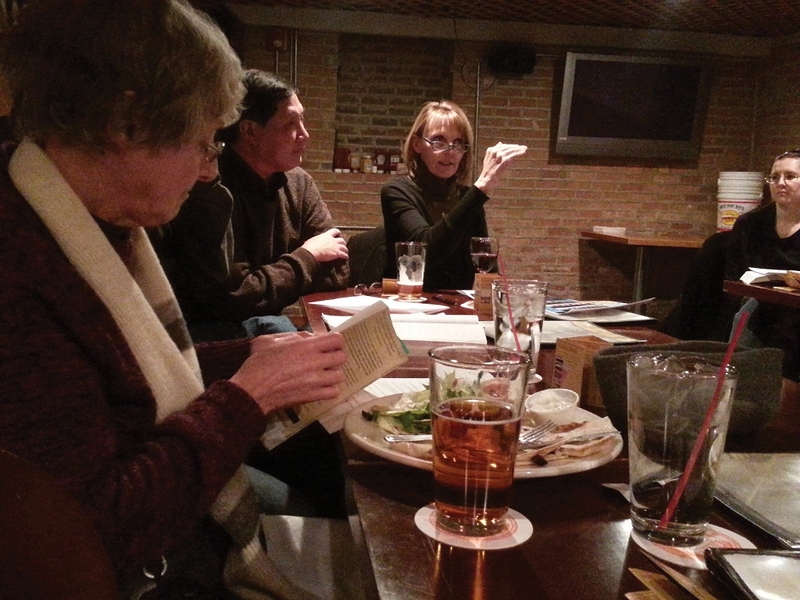 So far, Books on Tap members have discussed all sorts of books over a wide array of genres, including nonfiction, science fiction, and even postmodern Western. I have been lucky enough to be in contact with our Random House rep, and when we pick one of that company’s books, it sponsors the session by donating copies. Ultimately, I pick books that I want to read (since I’m part of the target audience) and generally find that they’re a good fit. Occasionally, I ask my members if they want to vote on their next book, but they refuse every time. They tell me they have enough choices in their day-to-day lives and that Books on Tap is a break from them. That is the best compliment they can give me. 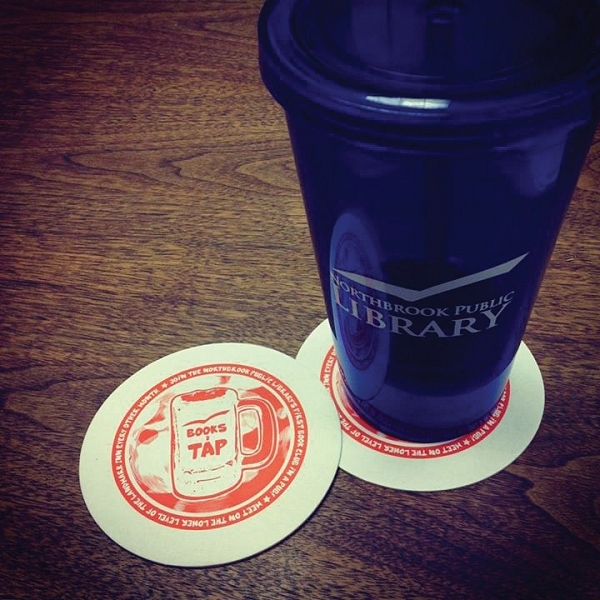 While the library hasn’t done a formal evaluation of the program, we all feel that Books on Tap is a great success based on various anecdotal evidence. First of all, it’s one of our best-attended book discussions and also has the most diverse attendee demographics. My original goal was to attract adults between 25 and 50 years old, and I’ve gotten close: Our first meeting had 27 men and women of varied ages, although most of my attendees have been 40 and older. Another core goal was to provide programs for a demographic that wasn’t very active in the library, and this has fit the bill. We’ve made it through a year so far and are still going strong. We started out meeting bimonthly and now meet in the Landmark’s private room at the end of every month. What’s more, we’re still running without any sort of dedicated funds. (The cost of the books is folded into our fiction budget, since we buy 15 paperback copies, and all other books are interlibrary-loaned.) All signage is created by the library’s graphic designer and printed in-house. As for publicity, a few core members told me they learned about Books on Tap from the train station posters. I ask new members at each meeting how they found out about us, and it is always one of three ways: word of mouth, the library’s Facebook page, or those posters in the train station. On a personal level, some of the proudest moments of my career have occurred while leading these discussions. It’s not very often that a man in his late 20s and a woman in her late 70s sit together over beers talking about books. I love that Books on Tap brings this diverse group together. This project never ceases to surprise and enlighten me. And ultimately, the library has created a new social outlet for our community. Does it really get any better than that? Leah White is a reader services librarian at the Northbrook (Ill.) Public Library. She holds an M.L.I.S. from Dominican University in River Forest, Ill. White was named a 2012 Mover & Shaker by Library Journal for her work in community building, and her book, The Big Book of Library Innovation, is due out at the end of 2013. Her email address is lwhite@northbrook.info, and you can follow her on Twitter @leahlibrarian.